I want to thank you one more time for your coming to Trnava. It was an extreme pleasure to meet you and listen to your super music. The combination of good weather, good music, and good people in audience made this year's Dobrofest real good. I believe that the late John Dopyera enjoyed the festival too. Dobrofest is over, but I hope that the dobro feelings we all have in those three festival´s days (and mostly at nights) will stay in your memory and heart forever. Don´t forget that old Dopyera´s slogan: 'Dobro means good in any language' and don´t stop to make this world better with dobro music. THANKS to you all one more time. I wish you lot of dobro (not only in the liquid form as Dobrowitschka) wherever you are. The Dobrofest lineup can be seen by clicking on the above copy of the poster. The next Dobrofest will be held at Trnava, Slovakia, in the last week of June 2008. Let me remind you of the event of the year, which will be held July 27th in Prague. Superstar Mr Ricky Skaggs will perform together with his Kentucky Thunder group at the festival MUSIC IN THE PARK. His performance will happen at 5 p.m. approx. Don't miss this occasion to meet a real star. The Prague performance by Ricky Skaggs & Kentucky Thunder opens their European tour, which also includes one show in Ireland and five in the UK. Full details are on the band's tour schedule. Hi, folks! We are in MySpace Music web: here. In October we will represent the European bluegrass bands at the IBMA Festival in Nashville USA (1-7 Oct. 2007) as #1 European Bluegrass Band 2006/7, the title we won at the EWOB Festival 2006 in Voorthuizen, Holland. We will have with us our new CD, titled Tutte le direzioni ('All directions'). At the moment we are starting to organize our European 2008 tour; if you have interest in the Mideando String Quintet band, please contact us. Have a good summer... CIAO from Italy! 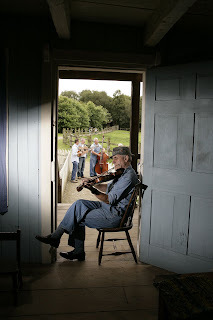 The award-winning Appalachian and Bluegrass Music Festival at the Ulster American Folk Park, Omagh, Co. Tyrone, Northern Ireland, now has its own website, showing the full programme for this year's event (Friday 31 August to Sunday 2 September); location map and details of accommodation in the area; and ticket prices, booking information, and contact data. Advance booking is essential for the evening concerts on all three days. This can be done through the Park's ticket hotline, +44 (0) 28 822 43292, or online through Ticketmaster. Advance booking is not needed for the afternoon 'Bluegrass in the Park' programme on Saturday and Sunday. This year's programme includes five USA acts headed by the Steep Canyon Rangers of North Carolina, who won the IBMA Emerging Artist of the Year Award last October. European bands taking part include Sunny Side (CZ), and Red Wine (I), both of whom have already made many friends among Omagh audiences. The professional membership of the International Bluegrass Music Association has elected three new members to the IBMA's board of directors, as well as reelecting one incumbent for a second term. Eddie Adcock, already in the IBMA Hall of Honor as a member of the 'classic Country Gentlemen', is reelected to represent artists and composers. Janet Davis, of the Janet Davis Music Company in Arkansas, represents merchandisers and luthiers. Rienk Janssen of the Netherlands, editor of Strictly Country magazine, event producer, record distributor, member of the EBMA board of directors, and EWOB coordinator for the EBMA, represents international members. Each was elected to a three-year term which begins on 1 October 2007. The board is IBMA's governing body which sets policy and determines long-range goals and priorities for the association. Members serve without compensation and bear the full expense of attending IBMA events and board meetings held at least twice each year. This will be Gary’s third year in Ireland in a row. In 2005 he toured with Gail Wade, and last year with David. David joins Gary once again this year and the two are preparing for a very busy musical adventure. The trip starts at the Athy Bluegrass Festival on 13 July and continues through 29 July with sixteen scheduled appearances during that time! The duo will be traveling and playing all over Ireland. You can find the complete schedule for the tour, as well as listen to some samples of Gary and David’s great sound, here; the schedule is also on the Bluegrass Ireland Blog. The Berea College Bluegrass Ensemble from eastern Kentucky, with special guest Alice McLain White, are about to begin a tour in Ireland. Berea College has been a focal point in Appalachian culture since 1855. The College's Bluegrass Ensemble owes much to the work of the remarkable McLain Family (Raymond W. McLain was at the EBMA's EWOB Festival a few years ago in Bill Clifton's 'Pick of the Crop' band). Thurs. 12th: ­O'Donovan's Hotel, Clonakilty, Co. Cork, 9.30 p.m.
Fri. 13th: ­Glen Theatre, Banteer, Co. Cork, 8.30 p.m.
Mon. 16th: ­Village Arts Centre, Kilworth, Co. Cork; with Gary Ferguson and David Miner, 8.15 p.m.
Tues. 17th: ­The Local Bar, Dungarvan, Co. Waterford, 9.30 p.m.
Wed. 18th:­ Sixmilebridge Folk Club, Gallagher's, Sixmilebridge, Co. Clare, 9.30 p.m.
Enquiries to John Nyhan, +353­ (0)87 792177. It's fitting that Chris celebrates his birthday on the same day as Uncle Sam. For one thing, Chris's life is a study in independence, and for another, this German immigrant has done as much as any living person to preserve and promote American traditional music of all stripes. Christian Strachwitz was born in 1931 in Groß Reichenau, Lower Silesia, Germany (now Bogaczów, Poland), emigrated to the United States in 1947, and founded Arhoolie in 1960. 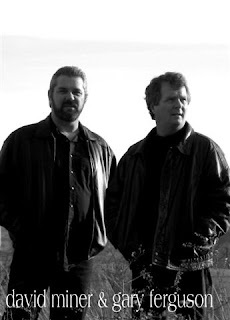 The label's catalogue includes blues, cajun, zydeco, gospel, jazz, tejano, world music, and old-time and bluegrass artists such as Del McCoury, Vern & Ray, Rose Maddox, J. E. Mainer, and Snuffy Jenkins.